Harmon Byron (Photographer) . Top Mt Resplendent.. Banff: Photographed and Copyrighted by Byron Harmon, Banff, Canada, [before 1942]. Description: Four climbers descend from the summit of Mt. Resplendent, this photograph likely taken during the ACC camp at Mt. Robson in 1913. Mt. Resplendent is a neighbour to Mt. 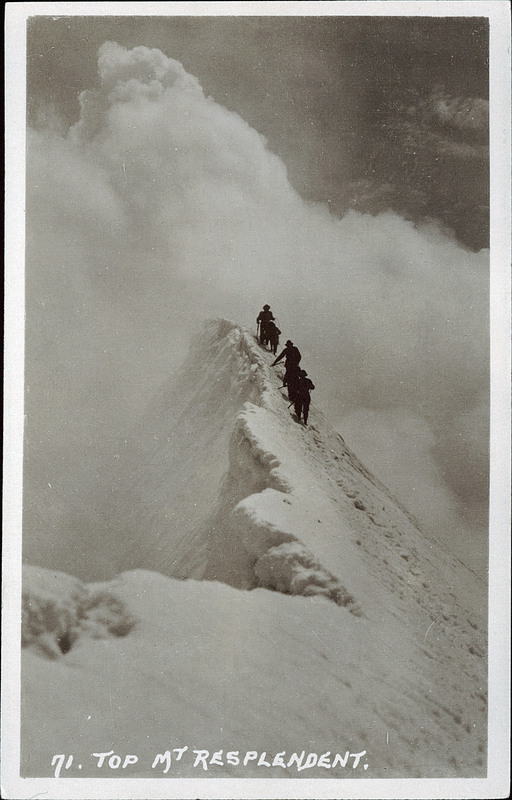 Robson and was first climbed by Conrad Kain and Byron Harmon in 1911. Conrad Kain was one of the most successful and well known mountain guides of his period with numerous first ascents to his credit, including Mt. Robson which is the highest peak in the Canadian Rockies. He participated in many notable expeditions with the ACC and individual climbers, hunted and trapped during the winters, and wrote an entertaining autobiography of his exploits, "Where the Clouds Can Go"
Physical description: 1 postcard : sepia ; 14 x 9 cm. PC009543: "Top Mt Resplendent." is licensed by University of Alberta Libraries under the Attribution - Non-Commercial - Creative Commons license. Permissions beyond the scope of this license may be available at http://peel.library.ualberta.ca/permissions/postcards.html.